Unlock the potential of networked AV systems with a new range of capability expanding, workflow-enhancing solutions for your nodes’ needs. Manufacturers are answering the call for simplified connectivity, configuration that doesn't require a PhD, and remote monitoring. Now is the time to benefit from their R&D efforts. Crestron’s next-gen DigitalMedia NVX Series makes it possible to transmit 4K60 4:4:4 HDR video over standard 1 Gigabit Ethernet, with no latency. The DM NVX Series provides a scalable network AV solution, from a simple point-to-point setup, to thousands of endpoints, and requires only DM NVX Encoders/Decoders. Built-in intelligent software makes everything easy to configure, commission, and control from the web. Boxilla provides a centralized, easy-to-use command center that gives you remote-monitoring and control of not just devices, but your entire system, all across the enterprise. Tech managers can send commands to network switches; control user access; monitor device status; and diagnose and address network problems before they occur. works in conjunction with the InvisaPC KVM solution to let tech managers proactively identify and address potential performance problems before they occur. Upgrade thousands of remote endpoint devices without ever leaving your seat, let alone the building. A range of workflow options are provided by AJA’s first standalone HD/SD H.264 streaming and recording device, which features both 3G-SDI and HDMI inputs and outputs, the power to handle up to 1080p recording formats and a web-based UI for easy configuration. At bitrates of up to 20 Mbps, the compact, portable HELO allows tech managers to simultaneously stream video signals directly to Web Content Delivery Networks (CDNs) while recording either to an SD card, USB drives or network-based storage, with dedicated record and stream buttons for easy operation. Get quad 4K encoding and streaming capabilities with Matrox’s new addition to its H.264 AV-over-IP portfolio, the Matrox Maevex 6100 quad encoder card. Delivering quad 4K input capture, the Maevex 6100 also offers multiple encodes, variable bitrates, and a broad choice of protocols, allowing simultaneous streaming and recording of four or more channels. The bundled Matrox PowerStream Plus software application and available API provide flexible management of local or remote data, ensuring full reach and control over the entire network. Transmit audio and control data together over the Dante network protocol with Audio-Technica’s two newest Dante-enabled ceiling-mount microphone solutions: the ATND931 Dante six-inch gooseneck microphone and ATND933 Dante hanging microphone. Both are available in a number of configurations, including black and white color options and a selection of three polar patterns (cardioid, hypercardioid and MicroLine). All configurations come standard with the new ATND8734 Microphone Ceiling Mount Power Module with Dante Network Output, offering a simple and cost-effective solution for integrating these new microphones with a Dante network without the need for a separate, standalone audio interface. Shure Incorporated’s Microflex Advance portfolio of premium networked ceiling and table array microphones, audio interfaces, and control software provides AV conferencing that integrates seamlessly into a premium meeting space aesthetic. Offering easy and efficient analog to digital/digital to analog conversion, Microflex Advance’s four Shure Audio Network Interfaces provide seamless audio routing in and out of the Dante networked audio domain. All Audio Network Interfaces include a single Ethernet port for easy Dante Audio routing and a browser-based software for control of connectivity and monitoring. Biamp’s TesiraLUX provides low-latency, 4K networked video distribution, transporting both audio and video signals over a single network via AVB/TSN, which guarantees a total system latency of less than two frames (33 ms at 60 Hz), including scaling, compression, and network transit. AVB/TSN bandwidth reservation capabilities coupled with TesiraLUX’s bandwidth management tools also set up customers to create truly converged networks rather than dedicated AV media distribution network infrastructure. The Audix M3 is an ideal audio capture solution for video conferencing, distance learning, courtroom activities, and surgical procedures. It can also be used for ambient room miking and surveillance. The M3 ceiling microphone incorporates three phase coherent hypercardioid capsules with tailored frequency response optimized for speech intelligibility. This is accomplished by minimizing frequencies caused by noise, vibration, paper shuffling, keyboard strokes, fans, and heating /air conditioning. Low noise preamp circuitry is employed for highest possible signal to noise and studio quality sound. Electronics above the ceiling are housed within a plenum rated junction box and cable connections are made via an RJ45 connector embedded within a proprietary brass housing for an airtight seal. The M3 installed ceiling microphone connects to the input of a mixer or DSP console via a breakout cable (provided). SoundTube’s four new Dante-enabled in-ceiling and surface-mount speakers are complemented by two IPD4 Master Speaker models that allow the connection of non-Dante speakers on the network. SoundTube’s system not only permits individual setup of speakers, with the SoundTube STNet Switch (or a standard switch) it provides proprietary 40-watts-per-channel PoE to any STNet speaker on the system. Speakers are self-monitoring and report voice coil, amplifier and overheating issues. Each speaker in an STNet system can be part of a zone or can be in its own zone. Because configuration of each speaker is done through software, no re-wiring is required if the system requirements change. Meyer Sound’s AVnu-certified Galileo GALAXY network platform incorporates the latest FPGA-based processing with up to 64-bit resolution for increased dynamic range, a lower noise floor, and analog-in to analog-out latency of only 0.6 ms. Available tools include five-band U-Shaping and 10-band parametric EQ, a delay matrix and improved delay integration. Three versions are available—Galileo GALAXY 408, Galileo GALAXY 816 and Galileo GALAXY 816-AES3—to enable specification of analog or AES3 digital inputs and outputs to suit any application. HARMAN Professional Solutions is offering the AMX N2400 Series video encoders and decoders, the first video-over-IP solutions to deliver 4K content over Gigabit Ethernet networks with near-imperceptible latency. With support for 4K video at 60Hz and 4:4:4 chroma, the N2400 Series joins a full lineup of cost-effective 4K solutions from HARMAN that enable businesses and active learning environments to bring ultra-high-definition video to viewers. The new series uses JPEG 2000 encoding to deliver content at native frame rate and color space over cost-effective standard Gigabit Ethernet with just two frames of latency. With support for HDMI 2.0 and HDCP 2.2, the N2400 Series is compatible with all the latest 4K sources and displays. The Q-SYS I/O-8 Flex Channel Expander is a compact, PoE+ capable networked peripheral offering cost-effective audio, control, and USB extension to the Q-SYS platform. Featuring eight flexible audio I/O channels, I/O-8 Flex allows tech managers to easily configure each channel via Q-SYS Designer Software as either a fully balanced mic/line input with phantom power or a line level output. It also offers PoE+ support for simple, single-cable deployments plus an auxiliary DC power input that can be used for redundancy where required. Acting as a Q-SYS peripheral, the I/O-8 Flex Channel Expander offers local Audio-to-USB bridging for integration with soft codec applications such as Skype for Business, GoToMeeting, etc. DVIGear’s next generation of DisplayNet DN-200 Series hardware and software leverages 10GbE Ethernet to switch, extend, and distribute uncompressed AV signals in real time with resolutions up to 4K (UHD). DisplayNet supports point-to-point extension, limitless matrix switching, video wall display and multiviewer. The DN-200 Series hardware supports HDMI 2.0, HDCP 2.2, DisplayPort 1.2, High Speed USB 2.0 (480 Mbps). Internal scaling enables full seamless switching regardless of input resolution. Choose between models supporting CAT-X twisted pair cables or signal distribution over fiber optic media using industry-standard SFP+ optical modules. NewTek’s IP Series provides a software-driven, infinitely expandable approach to switching, input, and output of video sources over IP and SDI. The modular video production system is also fully backwards compatible with SDI, using separate scalable high-performance components for the mixing and control, input, and output of sources allowing virtually unlimited scalability. Video, audio, and control signals from these components are transferred digitally using NewTek’s Network Device Interface (NDI) technology, allowing multiple video systems to identify and communicate with any other system over a standard computer network. Epiphan Video’s updates for Epiphan Pearl-2 and Epiphan Pearl all-in-one live video encoders make it easy to stream live video content concurrently to YouTube, Facebook Live, and other CDNs with a new multi-streaming feature. This leaves system power available for other tasks such as creating alternate channels and recording isolated camera views (ISOs) from even more sources. For more HDMI or SDI inputs, or to capture from VGA sources, this release gives Pearl-2 support for Epiphan’s AV.io family of video grabbers. This update also gives both Pearl and Pearl-2 support for generic USB cameras. Adder’s ADDERLink XDIP high-performance AV extender with USB and audio over a single CatX cable enables remote access to critical computing, while flexibly extending the desktop experience, all while using standard network infrastructure. The AdderLink XDIP can extend video, USB2.0, and audio along a single minimum spec of CAT5e cable for 100m, further by routing through an organization's infrastructure. It connects with a large range of USB devices and has a local feed-through port. LynTec’s Remote Power Control (RPC) Series of breaker panels offer the easiest setup and operation in self-contained panels for simple, intuitive power control. A built-in web server enables easy browser-based setup and control via smartphones, tablets or computers, while an astronomical timer allows for scheduling of events. RPC panels feature built-in, customizable sequencing for inrush control, over- and under-voltage protection, and automated on/off control to reduce electrical costs and protect electronics when not in use. New sequencing setup options allow all RPC controllable circuit breakers relay panels to offer a customizable step rate in-between each circuit being controlled; it also enables tech managers to decide the order that each circuit powers on. The RPC Series is fully compatible with any control system that communicates in IP, DMX-512, sACN, RS-232, Telnet, BACnet (IP or MS/TP) or has a browser-based interface. 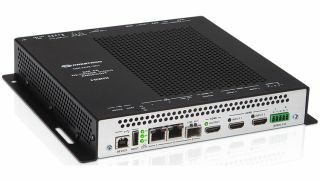 MuxLab’s new Dante/Quad Channel Audio PoE Gateway (500765) connects analog audio equipment to Dante-compatible professional audio equipment over an IP network. AV pros can easily scale audio systems and route audio over a network, with multipoint configurations enabled. This Gateway provides four full range (20Hz to 20KHz) single-channel analog audio inputs that can be transmitted over the network to professional audio equipment. Four single-channel analog audio outputs are provided for two-way receptivity. The inputs support balanced audio or balanced microphone signals. PoE support allows this product to be powered by the Ethernet switch. tvONE is shipping its new streaming media and 4K playback input module (CM-AVIP-IN-1USB-1ETH) and new HDBaseT input module (CM-HDBT-2IN-1ETH) for CORIOmaster systems. The new CORIOmaster streaming media and 4K playback module allows digital video from the cloud or the internet to be seamlessly blended with local media and AV connections and presented together on a video wall in any desired configuration. Compatible with the CORIOmaster, CORIOmaster mini and CORIOmaster micro, the module offers dual-channel 1080p60 streaming media as well as file playback, via USB3.0, of any resolution up to UHD/4K on the main channel and 1080p/60 on the secondary channel. Features include on-board 16Gb storage for video/still playback expandable to 128Gb. AVT: What makes Adder's AV-over-IP approach distinct, and what is the benefit for IT and AV managers?